Hey, inspiration! Are you out there? Inspiration is an elusive sensation with the power to move our minds and our emotions. 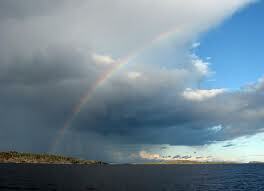 It may be captured in a sunset or a child’s smile or a rainbow. We may be inspired by a famous person or a person doing an heroic act or a close friend or a family member. Inspiration may touch our creative talent or our hearts or our self-image. It has the ability to come as a jolt or make the hair stand up on the backs of our necks or sweep over us and fill our souls. Yes, it’s out there. You is kind. You is smart. You is important. 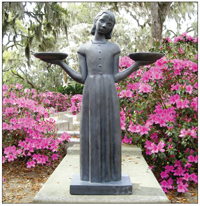 From The Help by Kathryn Stockett. As writers, we may experience inspiration in another way. It occurs when something triggers an idea and makes us want to start a story, develop a character, write a scene, or find words to a poem. The trigger could be anything. A person, an event, a landscape, an object, a natural wonder, a place, a work of art, a picture, a conversation, a headline. A thought. Whatever it is, it strikes or nudges and … won’t leave. Other times something just moves us. For example, a piece of art. However, describing what I see in a piece of art and how it makes me feel or how it inspires me is a subjective venture. Chances are it’s not what someone else sees or feels. And there in lies the joy of art. Each piece “speaks” to a person differently. 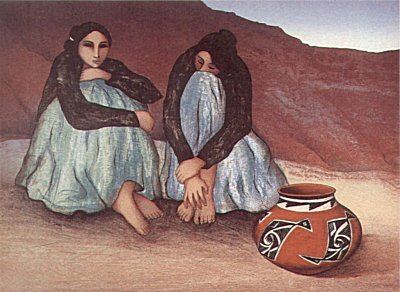 The original lithograph below is by Navajo artist R. C. Gorman. It hangs in our living room. Every time I look at it, I feel the remoteness of the setting, the harshness of the land, and the strength, patience, and courage of the women. And, strangely, a peacefulness. The women appear to be resting or waiting. Perhaps they are reflecting on the day’s events. The sky seems filled with a hopeful light, even though life may be hard, the terrain demanding. The lone pottery piece speaks of purpose, of a way of life, and traditions. Their lives are built on the past and carry on to the future. In today’s terms, I find the picture encouraging. We continue to survive, discover, and create. Despite the difficulties of the times, we find our patience, strength, and endurance. We learn and grow by reflecting on our lives or our goals or our situation. We build on gifts of past generations and our contributions become gifts to share with the future. Gorman works with little form but captures much content. 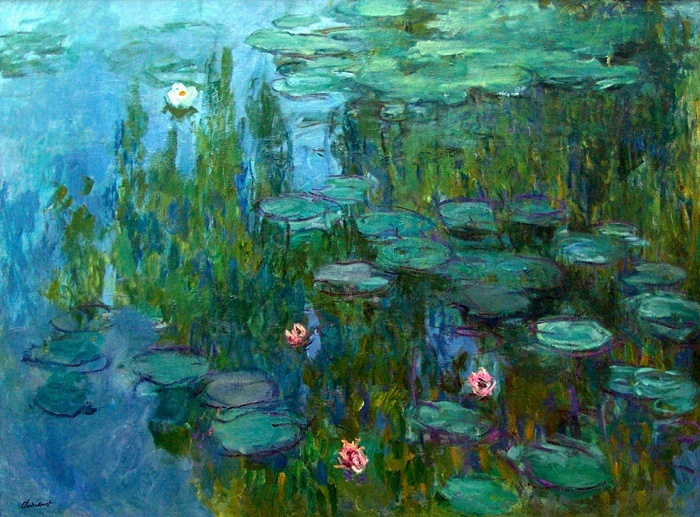 This work of art generates a feeling of peaceful reflection, of hope. It inspires me to seek and keep discovering the better part of me. Does a higher power put us in inspiration’s path? I think so. All we have to do is listen. And allow ourselves to feel. This entry was posted in Creativity, Inspiration, Reading, Writing and tagged Anton Chekov, Art, Bird Girl, Chinle, Edward Hopper, Kathryn Stockett, Monet, Nighthawks, R.C. Gorman, Sylvia Shaw Judson, The Help. Bookmark the permalink. 14 Responses to Hey, inspiration! Are you out there? Oh Wow!. You leave me inspired to explore what inspiration means to me and what inspires me. Thank you Carol. Hi Dolores – Inspiration is such a nebulous thing. Hard to quantify. But so concrete when it hits! Hi Susan – Thank you! Was the Taos Writer’s Conference to die for? Hi Tonya – Great. Wishing you well with your writing and its greater purpose. Thanks for stopping by. Loved your articles and I love the use of pictures they add an inspirational emphasis. Hi Jim – Thank you for stopping by. Glad the articles spoke to you. 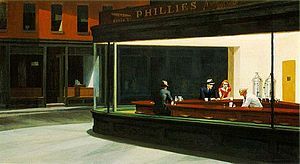 Regarding the questions you pose about Edward Hopper’s ‘Nighthawks’ in your August 1st posting, you might have a look at Chapter 14 of ‘Silent Theater: The Art of Edward Hopper,’ the award-winning book by Walter Wells. Do enjoy. Your blog is great. Hi Shelley – Thank you. Love the suggestion. Will do.